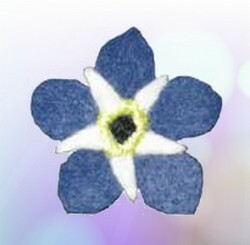 I saw this felt forget-me-not flower pin on SavvySeams (now closed) and thought it would make a wonderful Mother’s Day craft for mom, grandma or a favourite aunt. lds the blue petals and white petals together. Note: Do not rescale or resize the forget-me-not pattern – the grid squares should print out as one inch squares for accurate sizing; if you prefer, you can also copy the pattern by drawing it on a one inch square grid. Step 1: Cut out one large petal set and one small petal set. Step 2: Line up one on top of the other. Step 3: Use a satin stitch to attach the small petal set to the large petal set. Step 4: To raise up the satin stitching, slide the needle under the stitching and pull through. Do two or three times around. Then take the thread to the back and secure. Step 5: Use a dark color embroidery thread to fill the center. Step 6: Attach the sew-on pinback to the flower, stitching it to the backside of the satin stitching.